“The Pennies from Heaven scheme is successful because it offers such a practical and easy way to give and signing up is made easy – it’s because it involves regularly donating small amounts rather than one large amount.” Natalie Lepper. MIB Group. Staff at the Motor Insurers Bureau have been donating their payslip pennies since June 2009 and have 44% of staff participating. How do I get Pennies from Heaven running in my workplace? We believe that a little bit of effort can make big change so it is great to hear that you are interested in having a scheme running at your workplace. We recommend that Pennies from Heaven runs in organisations of 1000+ employees but speak to us if you think it would suit a smaller organisation you are part of. Many smaller employers do run the scheme. You can download a guide on this page which will provide you with some more details on the scheme. We would then recommend you contact your Community, Human Resource or In-house charity team – you can send them this guide. Or contact us – drop us an email telling us about your employer and we can contact them directly. Which charity can I give to? Each employer chooses one or more charities to which all staff and pensioners donate to – this can be any registered charity you like. Does the employer need a license to run the scheme and is there a charge? Employers need a license to run the schemeand this is something PFH will issue. Pennies from Heaven will agree a modest fee for the license to run the scheme and other services – this can be either an annual direct charge (meaning 100% of donations are distributed to the chosen charities) or a small deduction from donations.The fee will depend on the level of services provided and the number of employees. Some of the services provided by PFH include distribution services, HMRC compliance, gift aid assistance, charity support management, best practice sharing and fundraising consultancy. Employers should contact us to discuss fee options and don’t worry we always try and find a fee that works for everyone. It’s only pennies – is it worth it? I can already give through pay via Payroll Giving, isn’t this the same? No. 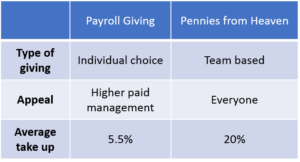 Pennies from Heaven is distinct yet complementary to other forms of Payroll Giving and fundraising activities and indeed the majority of employers running Pennies from Heaven also offer Payroll Giving demonstrating this fact. Why? Because employers want to make sure they offer all staff a way to donate through pay. 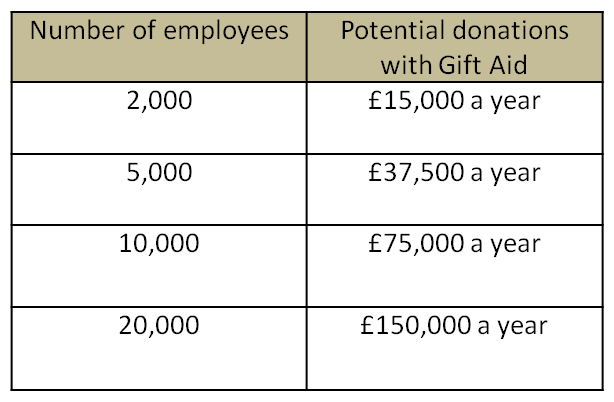 Traditional Payroll Giving schemes provide individuals the choice of how much to give and to which charity and are more popular with people employed in more senior positions and those on higher salaries. Pennies from Heaven donations are less than a pound so appeal to everyone particularly part time or lower paid workers. Just because you earn less does not mean you care less, but you might not be able to afford or commit to the higher recommended regular payments of Payroll Giving schemes. “We have over 50% of our employees donating the pennies from their salary every month through the Pennies from Heaven scheme. Those that want to donate more or be more specific about where their donation is going, sign up to Payroll Giving.” Debbie Lombard – Director of HR and OD, VocaLink.